...Create Extra Room for your Passenger! RK-65: Free up space for you and your passenger by relocating the trunk 1", 2" or 3" back from the factory location. 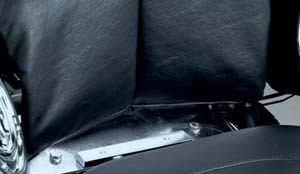 Improves passenger ergonomics and once installed can be easily adjusted with simple hand tools to locate ideal positioing. 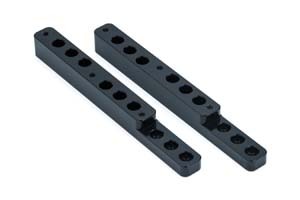 Durable construction from machined and drilled aluminum. Indian: '15 to current Roadmaster Models (except Roadmaster Classic) & '14 to current Chieftain Models if Equipped with a Painted Tour Trunk. Note: Requires the removal of the factory trunk bumper tube. RK-31: Give your passenger the freedom they deserve. This Adjustable Tour-Pak Relocator does just that with a flip of the easily operated locking levers. Allows adjustment of the Tour-Pak from 1" forward to 3" back from the stock position without tools. 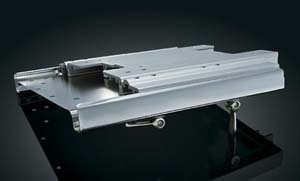 Interlocking aluminum extrusions ensure smooth, controlled motion. The locking levers and rear accent panel are elegantly designed and beautifully chromed. 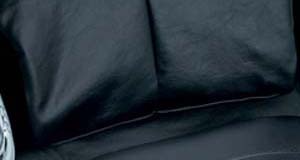 An extended-length vinyl pad/wiring cover for the front of the Tour-Pak is included for a factory finish appearance. Enjoy the ride for miles ahead. Fits: '14 - current Electra Glides, Road Glides, Road Kings & Street Glides equipped with rigid mounted or detachable King, Ultra or Chopped Tour-Paks. RK-56 & RK-56T: Gain a few extra inches for going those extra miles. This handy kit moves the Tour-Pak® 1", 2" or 3" back to provide more room for your passenger. 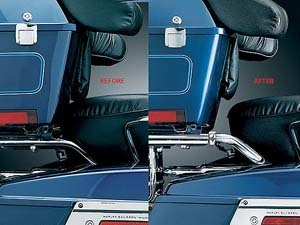 The added space makes things much more comfortable for the passenger and makes climbing on and off much easier. 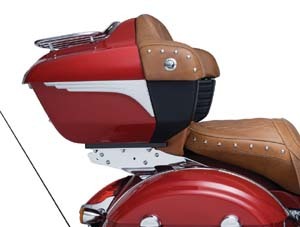 Fits '14 to current Electra Glides, Road Glides, Road Kings, Street Glides & Trikes Equipped with Rigid Mounted or Detachable King, Ultra or Chopped Tour-Paks. RQ-73: With motorcycles, one size does not fit all. Introducing the Quick Adjust Tour-Pak Relocator. The Quick Adjust Tour-Pak Relocator is the first & only to offer a full 4 inches of adjustability without the need for tools. 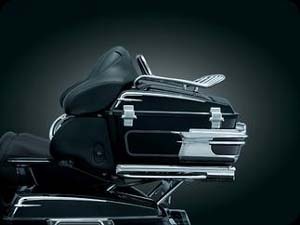 Adjustments can be made without tools 1” forward to 3” back from the stock postition, giving you & your passenger the ultimate in comfort Fits: Late ’00-’13 Electra Glides, Road Glides, Road Kings & Street Glides (including '09-'13 CVO Models) with Rigid Mounted Tour-Pak and ’97-’13 Electra Glides, Road Glides, Road Kings & Street Glides with H-D Two-Up or Solo Detachable Tour-Pak Racks & King, Chopped or Razor-Pak Tour-Pak. Note: Not compatible with amplifiers found stock on Screamin’ Eagle Models or included in H-D’s “Enhanced Sound System”. Not compatible with leather covered Tour-Paks. Will fit ‘98-early ‘00 Touring Models with rigid mounted Tour-Pak if the stock support tube as been replaced with the ‘00-’08 support. 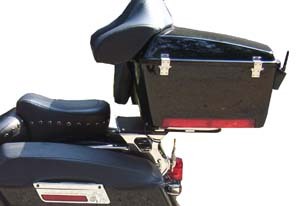 FP-42 Filler Panel: If you've used our Fixed Tour-Pak Relocator, RK-56, to move the Tour-Pak on your '14-'16 Touring bike rearward more than an inch or two and would like to cover the exposed area behind the seat, here’s the answer. The Filler Pad replaces the stock pad on the front of the Tour-Pak in just minutes. Design also incorporates hook & loop straps on the backside to secure the wiring. Great looks with a little extra comfort for your passenger. 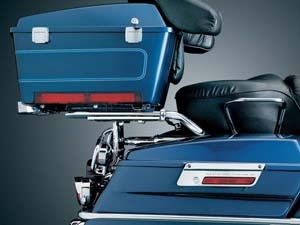 FP-42 fits '14-current Electra Glides, Road Glides, Road Kings, Street Glides & Trikes Equipped with Rigid Mounted or Detachable King, Ultra or Chopped Tour-Paks. 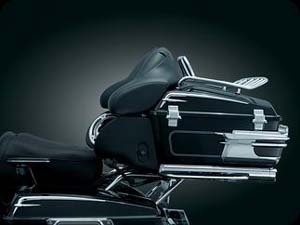 FP-52 Filler Panel: Similar to above but fits '97-’13 Electra Glides, Road Glides, Road Kings & Street Glides equipped with Tour-Pak Relocators. RK-57: Relocator kit for rigid mounted tour-paks. Gain a few extra inches for going those extra miles. This handy kit moves the Tour-Pak® back 1", 2" or 3" to provide more room for your passenger. 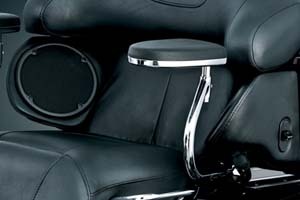 The added space makes things much more comfortable for the passenger and makes climbing on and off much easier, especially if the bike is equipped with a driver backrest. 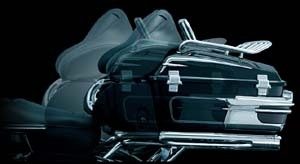 Fits: '09-'13 Electra Glides, Road Glides, Road Kings, Street Glides & Trikes Equipped with Rigid Mounted or Detachable King, Ultra or Chopped Tour-Paks. RK-SE-14: Adjustable tour-pak reloctor kit for Project Rushmore model year 2014 to current CVO, Screaming Eagle bikes with amplifier underneath tour-pak, CVO leather tour-paks or the FLH platform. Gain a few extra inches for going those extra miles. The RK-SE-14 Relocator moves the Tour-Pak® back either 1 1/4" or 2 1/4" to provide more room for your passenger. The additional space provides comfort for your passenger and even makes climbing on and off much easier. 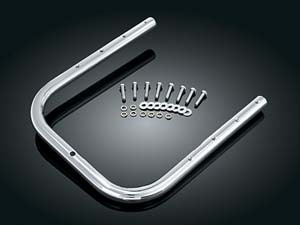 The Relocator bracket bolts onto the existing Harley-Davidson stock bracket and comes with full hardware kit and instructions that even the most challenged can follow. The Relocator will also work with the amp kit that mounts underneath your Tour-Pak®. Does not fit the Tri-Glide. Karen M.: "We got this, put it on the bike over the weekend and LOVE IT!! Thanks so much it was worth the wait. Hope to do business with you again in the future. :) Have a great week!!" 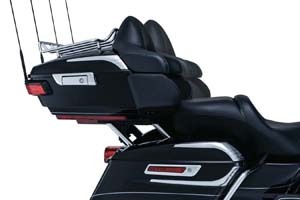 RK-SE-9: Adjustable tour-pak reloctor kit for CVO, Screaming Eagle bikes with amplifier underneath tour-pak, CVO leather tour-paks, Tri-Glide or the FLH platform. Ajustable from 1-1/4", 1-1/2" and 2-1/2" back to provide for more room for your passenger for those longer tours. Fits '09 to '13 model years with fixed or detachable tour-paks. Includes installation hardware. RK-SE-8: Similar to above for CVO, Screaming Eagle bikes with amplifier underneath tour-pak for MY '99 to '08. Includes installation hardware. RK-1B: A few extra inches for going those extra miles. This handy kit moves the Tour Pak back 2 full inches to provide more room for your passenger. The added space makes things much more comfortable for the passenger and makes climbing on and off much easier, especially if the bike is equipped with a driver backrest. 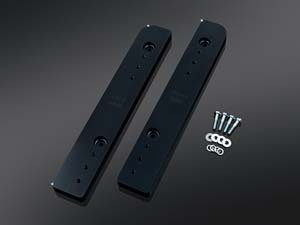 Installation is easy and involves replacing the stock support bar with the RK-1 support bar and hardware. 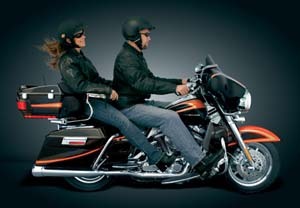 Fits '98 to '08 model Ultra Classic Electra Glides with rear speakers, Classic Electra Glides and Road Glides or Road Kings with standard non-detachable Tour-pak. Now with extra chrome. 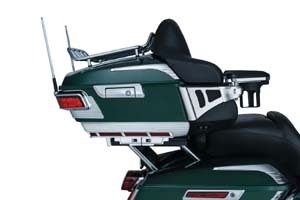 Note: Not compatible with the enhanced power-amplifier H-D accessory that mounts underneath the Tour-Pak. Does not fit the quick detachable Tour-pak. 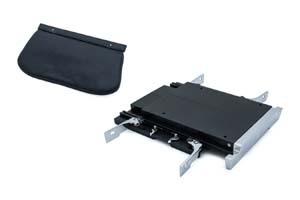 RK-2B: Now, the comfort and additional room provided by our Relocator Kit for fixed mounted Tour-Paks is available for riders using H-D’s detachable version. 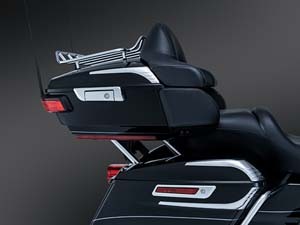 As designed, H-D’s Detachable Tour-Pak provides three positions: Full Forward, 1” Back, and 2” Back. Our Relocator Kit effectively shifts this range of adjustment back an additional 2” allowing you to select a position 2” back, 3” back, or 4” back relative to the original full forward position. 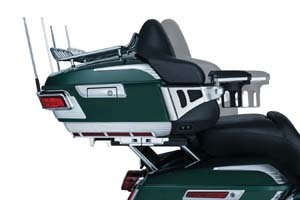 Fits: ’97-’08 Road King, FLHT, FLHX, and FLTR Models equipped with H-D Two-Up or Solo Detachable Tour-Pak Racks (H-D P/Ns 53276-04 or 53260-02) and King or Chopped Tour-Paks. 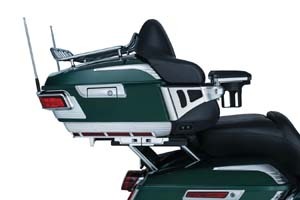 Note: Not compatible with H-D’s original Detachable Tour-Pak Rack design (H-D P/N 53107-96). 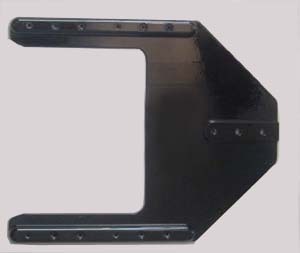 This style of rack has a tubular frame topped with a flat plate. RK-HC-45: A custom relocator git to give you 4.25" of sitting area. Gain a few extra inches for going those extra miles. This handy kit moves the Tour Pack back 4.25" providing more room and COMFORT for you and your passenger. May require relocation of License Plate on some models. For models using detachable rack HD-276 only! 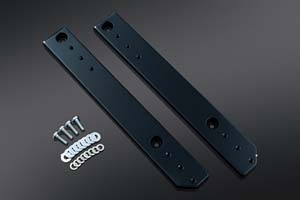 The Relocation Kit is 3/16" high quality aluminum that is powder coated in a matte black finish. Any additional hardware required is supplied. The 4.25" setback requires no new mounting bracket. It fits '97 to 2008 Touring models equipped with the detachable rack. Special sale order. RK-HC-25: A custom relocator kit similar to above but 2.5" positioning for 2.5" rearward. 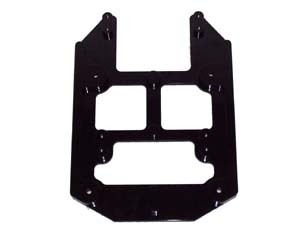 This 2.5" setback requires a new mounting bracket that is supplied. 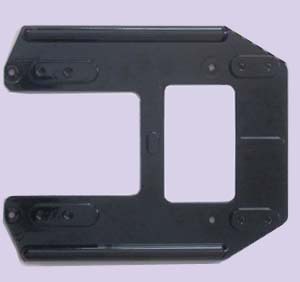 You will need to remove the two plastic plugs that your current bracket has, and install them on the new one provided. 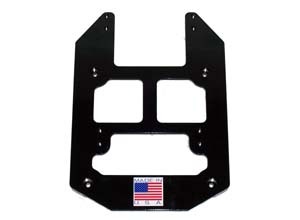 The new mounting bracket is made of the same (or better) quality steel than provided by Harley. It is powder coated black with new holes already drilled that is required for the 2.5" setback. Any additional hardware required is supplied. 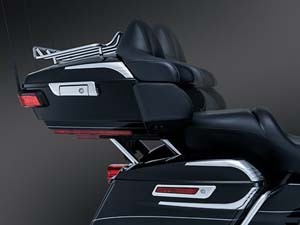 It fits '97 to 2008 Touring models equipped with the H-D OEM tour-pak and H-D detachable rack. Special sale order. RK-HC-9: Another custom relocator kit offering similar in design to above units, but for later model years. 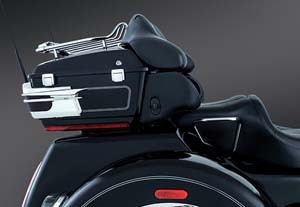 Designed for Detachable Tour-Paks to move passenger back 2" or 4". Fit model years '09 to '13. Special sale order.